Gunter Babysits - Gunter offers to watch all of Rosita’s 25 piglets for the night, trying to prove he’s the best babysitter ever. Love At First Sight - During a piano lesson with Johnny, Miss Crawly becomes nostalgic about the dancing and romancing of her youth. Johnny convinces her that it’s not too late to find someone and helps her setup a profile on a dating website. Eddie’s Life Coach - Eddie’s mom signs her slacker son up for a digital training seminar to get his life back on track. 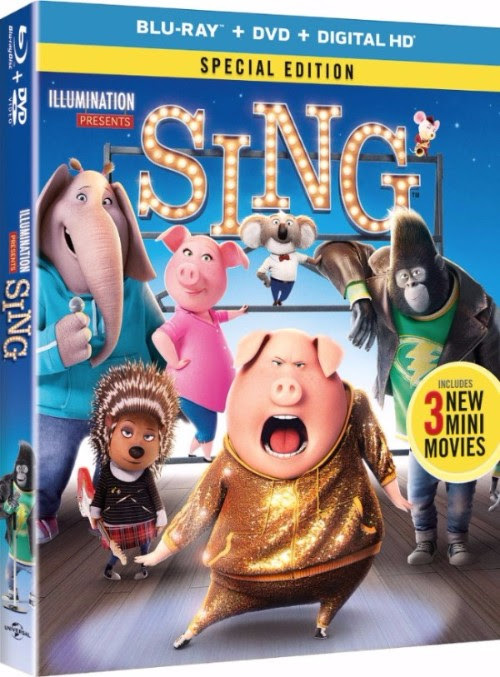 Finding the Rhythm: Editing SING - Illumination editor Greg Perler, takes us inside the edit bay and reveals the secrets behind cutting an animated film. We’ll plunge into his world in this fun and eye-opening peek inside the room where the magic gets put together. The Making Of The Mini-Movies - We’ll explore the themes of each of the mini-movies through the eyes of the artists who made them.